Dr. Brandon Cooke, Associate Professor of Philosophy, taught an Honors section of Introduction to Ethics in spring semester. Below, he reflects on teaching ethics to Honors students. “So, what’s your philosophy?” It’s an occupational hazard of being an academic philosopher that strangers will ask this question when they find out what you do, especially when you are trapped and have to be pleasant, like when you’re on a plane or at a wedding reception. People mean well when they ask this question. It’s just that they don’t know enough about philosophy to know that the kind of answer they want—something short, witty, and deep—will fail to be all of those things if it even remotely resembles your professional thinking. It is said that the great philosopher Immanuel Kant took “Sapere aude” (“Dare to know”) as his motto, but as inspiring as that is, it hardly does justice to Kant’s transformative and immense body of work. My favorite answer to the question comes from the philosopher Kwame Anthony Appiah (who visited MSU a few years ago): “Everything is more complicated than you think it is.” As a slogan it has some important virtues: it is true, it is short enough not to be boring, and it opens the door to a more extended dialog. I like to approach teaching ethics with this answer in mind, because ethics is something most psychologically healthy adults think they have a pretty good grasp of, even though surprisingly few people can give a reasonable justification for the views that they have. And it’s something that is very important to reflect well on, because there are many ways to get it wrong, and the consequences of doing so can be severe. The fundamental questions that structured our course are deceptively simple: What makes a life good? What must I do? How should I live? Before we looked at different answers to those questions, we had to clear away some common but misguided ways of thinking about ethics. In particular, we had to see that ethical judgments are more than mere expressions of individual preference, and not simply equivalent to claims about what is accepted or rejected in particular cultures. In other words, when it comes to ethical judgment, I could be wrong, you could be wrong, and sometimes we all might be wrong. One important and surprising result from this is that respecting difference and being open-minded (two very good things) means rejecting the idea that one set of values is just as good as any other. Everything is more complicated than you think it is. In thinking about what makes a life good, we saw that being happy and getting what you want can be important, but that as ideals of the good life, these two are fatally flawed. The good life, we saw, is one that includes happiness, but also some other goods such as knowledge, autonomy, and accomplishment, and these might actually cause unhappiness. Yet we still would not rate a life without these very highly. In thinking about what we must do and how we should live, we turned to John Stuart Mill, Kant, and Aristotle (among others), who all were in one way or another struck by the poor quality of ethical thought manifest in ordinary thinking, and by the limitless capacity of homo sapiens to justify bad behavior. These three certainly made mistakes of their own, but the ethical theories they developed are still very appealing conceptual frameworks for thinking about right and wrong, and good and bad. All of them help us to see that the idea of ethical values being independent of our individual or cultural preferences is not a crazy or mysterious one at all. And one of the most powerful uses of such an ethical framework is that we can examine our own cultural practices and see where they are confused or pernicious. Does this way bring about as much well-being as possible, compared to anything else we could do? Does this treat everyone affected with the respect they are owed simply in virtue of what they are? And does this make sense from the standpoint of a choiceworthy, fully realized human life? It is easy enough to direct those questions on things like Naziism and slavery. It’s much harder to turn those questions onto practices that are deeply embedded in our own way of life. We finished the semester by thinking about factory farming and football. Are these things ethically defensible? These topics seemed to cause more discomfort than any of the others we examined. Some students answered no for both of these, but many did not. That said, my sense was that even those who thought that factory farming and football were completely above ethical criticism could see these positions weren’t the default ones, that holding them meant responding thoughtfully and honestly to some rather difficult arguments. Everyone in the course certainly learned that everything—even those things that are part of the cultural air we breathe—is more complicated than most people think it is. Our Spring 2015 Graduates at the 2015 Spring Honors Convocation. As April and May roll in and warmer weather marks its promise of renewal for our region of the world, the Minnesota State Mankato campus community takes time to reflect on students’ successes through assemblies, convocations, honorary meetings, and ultimately our commencement ceremonies. 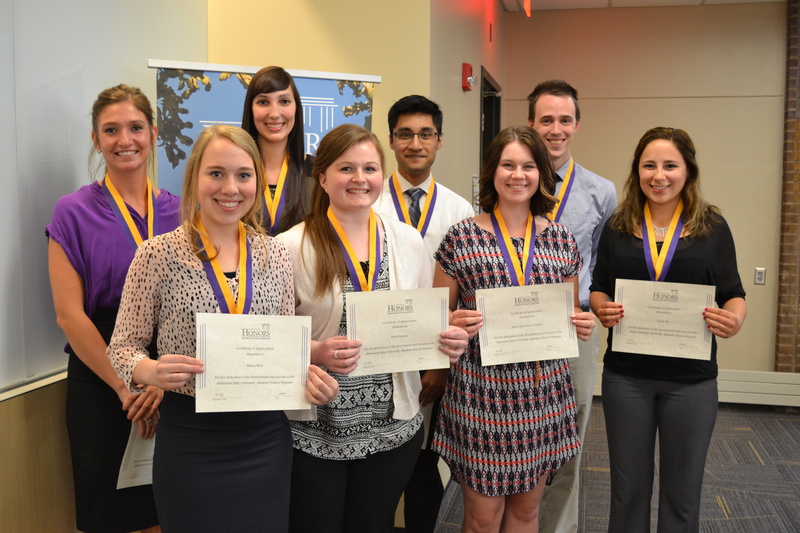 The Honors Program recently celebrated the success of its graduates at our annual convocation. The convocation was nicely organized by our staff, and over one hundred people attended, including faculty, advisors, administrators, and family and friends of our graduates. We recognized the great work of the faculty and students, and Haley Doran gave the senior address to the community. After having worked with the students for several years, it is extremely satisfying to use the convocation, in part, to see the students off onto their next journey in life. Springtime and convocation provide an opportunity to reflect upon the students’ journeys. What has surprised me the most over the last few years is how many of our students choose to further their education in graduate school rather than enter the job market after graduation. I understand how this would have been a good decision for several years after the economic crisis of 2008-2009, but in an era where seasonally adjusted unemployment rates for Minnesota are below 4%, it seems strange that more students aren’t directly entering the labor market. But maybe it isn’t so strange? Might it be the case that our honors students, as a group, are making really good decisions concerning their future? On the one hand, we might look at the economic incentives to attend graduate school. Recent data from the Bureau of Labor Statistics provides some context. Nationally, unemployment rates for those aged 20-25 are hovering around 10%, more than double the average for all those seeking work. Unemployment rates for those in the next age segment (at approximately the same time one might complete a master’s degree) fall to 4.4%. In 2014, the unemployment rate for those with a Master’s degree was .7% less than those with a Bachelor’s degree (2.8% for Master’s, 3.5% for Bachelor’s). Moreover, median weekly earnings rose over 25%, from $792 to $1102, for those with a Master’s. While we do hear media horror stories about law school graduates who can’t find work after taking out hundreds of thousands of dollars in loans, unemployment and salary statistics indicate that students who choose to attend graduate school in financially responsible ways are indeed making rational decisions about their future. They are further developing their skills and experiences in ways that potentially create more demand for themselves after graduate school. On the other hand, we also could look at the emotional pull of graduate school. All of our honors students work one-on-one with faculty to develop a research project, and they present their work at local, regional and national conferences. Honors students have the opportunity to present their work at the Upper Midwest Regional Honors Conference, or at the Annual Conference of the National Collegiate Honors Council. In some cases, the projects mature for over a year. The students develop their ideas, learn how to ask questions according to their own disciplinary approaches, devise hypotheses and methodologies for solving the problems, and present their findings to the public. During this process, students see faculty work from another perspective. They become immersed in a body of knowledge organized by a community of scholars, and they see the links between their findings and their application to social problems. They transition, in other words, from recipients of knowledge to creators of knowledge, from students to professionals, a process that is tremendously empowering and has rich personal rewards. In this context, graduate school pulls them to develop greater opportunities to conduct investigations, to solve problems, and to investigate the human condition. When you add this deep experience in research to the daily interactions our students have with faculty and staff throughout the University, you can better understand why our students choose to attend graduate school. Our graduate students, as GA’s, provide incredible role-models for the honors students. Our administrative and service faculty – our advisors; our Institutional Diversity staff; our student life and residence hall staff; our student activities and student union staff – all of them will or have earned graduate degrees and they are responsible for many of the excellent learning experiences our students have at Minnesota State Mankato. Daily life brings the students into contact with those whose lives have been impacted by graduate school. It is no surprise that the students increasingly consider the option as they grow and learn. In the past few years, faculty have invited our graduates to study with them at the University of California-Irvine, Indiana University, the University of Minnesota, West Chester University, the University of Maryland, the University of Michigan, the University of North Carolina, Minnesota State Mankato, the University of South Dakota, the University of Wisconsin, Geneva College, Penn State University, the University of Iowa, the University of Washington, the London School of Economics, and the University of Manchester. These are just examples of the wide range of graduate schools which have opened their doors to Honors Program students. Maybe it isn’t so strange that so many of our honors students choose to attend graduate school, after all.